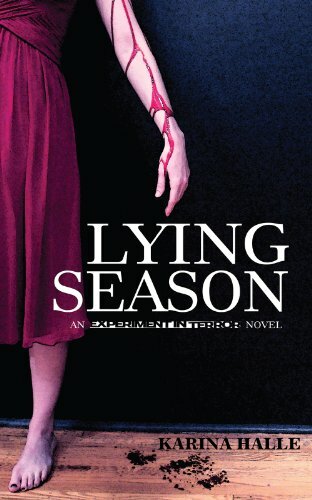 Just Finished Reading Lying Season by Karina Halle & I’m Freaking Out!! The Torture Is Just So Gooood!! OMG!!! O. M. G.!! Help meeeee!! I have just read one of the most awesome books ever (#4 in the Experiment in Terror series – I TOTALLY TOTALLY get it now, why everyone freaked right out…), and I’m on such an emotional angst-y adrenaline rush right now. AND!!! It ended on a freakin’ cliffhanger and book #5 is waiting for me to read it. BUT!! I have to work and then review #3 & #4 before I can move onto #5. I’m literally shaking. How am I going to live until then!?? How? Won’t someone tell me? I feel like haven’t slept in days. The buildup to this very book was just so good, but this one… *wow* *phew* *whooooooooo* just took the cake. I…WOW. Shaking. I’m in so much agony, yet delighted to feel this way. Hurts. So. GOOD! Okay… I gotta get back to work (dunno how I’m going to be able to concentrate… but oh well). Tell us how you REALLY feel Maryse!!! LOL. I am going to have to go ahead and read it. Not into scary books but sheesh….you have very curious!!! The paranormal is big in these (ghosts and such) – the two main characters are human, but it is THEM that make the story, ya know? SO good. I loved this book. I just finished this series and. Can’t tell you how much I loved this. It was pain nd pleasure wrapped neatly in a bundle. I LOVED this series too! Perfect creep to sexual tension ratio for maximum reading enjoyment! Yep Jurisha I have read ’em and they were AWESOME BUT!! I’m so glad I only read them after book #3… so that the “mystery” that is DEX remained a mystery while I read the first few books. I liked wondering… you know. But the dance scene is one of my favorites so far, and to have it from his POV was icing on the cake. Maryse… Just finished #3 and I am gonna get into #4 ASAP. I read your little entry about Lying Season and you have captured how I feel to a tee. This series just gets better and better. I am going to freak out when it is over. Will I survive #4??? Maryse Good Point! I didn’t even think about the POV’s since I read them after book #5. I would definitely recommend reading them last. I’m barely surviving Lise. My work is suffering today… eeeep! But is it worth it. OH YES!!! This is a 5 star read for sure, and one that will make you feel EVERYTHING. And there’s always book #5 that’s already out and waiting for us… (although I hear… perhaps a cliffhanger too). grrrr!! BUT!! I am exhilarated so it’s all very worth it to me. Wow I really struggled to get going with the first book. After reading your post, I’m thinking I might have to power through. They get better and better as they go, Kate. I’m writing review #3 right now, but #4 was just so BIG!! Help you!!? No! HELP ME!!!!! DO NOT GO in if you haven’t completed the series (or if you don’t like spoilers). We’re gonna let it all hang out in there.